Chinese researchers developed new transistors with all optical inputs which could work without electricity supporting making them applicable in some electricity forbidden environment. Transistors are the most important semiconductor components widely used in electronic equipment like computer, mobile phone and TV. The transistors have two electric inputs: gate and source. A feature of the transistors is that its output current can be tuned by the gate electric input. By replacing the gate electric input of transistor with a light input or by adding an extra light input, phototransistors have been developed that can tune the output current using light, which is widely used as light controlled switches in some devices. However, both for transistors and for phototransistors, the output currents all depend on the source electric input, the new type of transistors with all optical gate and source inputs have not been developed. Recently, researchers developed transistors with all optical inputs for the first time (Figure a). This new device could output electronic current signal under near-infrared source light illumination, and interestingly, this current signal could be enhanced for 100 times by another gate ultra-violet light (Figure b). This device shows transistor-like characteristics but do not require any electric power supply, thereby is called as all-optical-input transistor. The characteristic of light controlled photocurrent enhancement is due to the light controlled Schottky barrier of the Ag/TiO2 junction. The formation of the Schottky barrier at the Ag/TiO2 is due to the chemisorbed oxygen on the surface of TiO2, the height of this barrier can be decreased by the ultraviolet light through an oxygen desorption process. 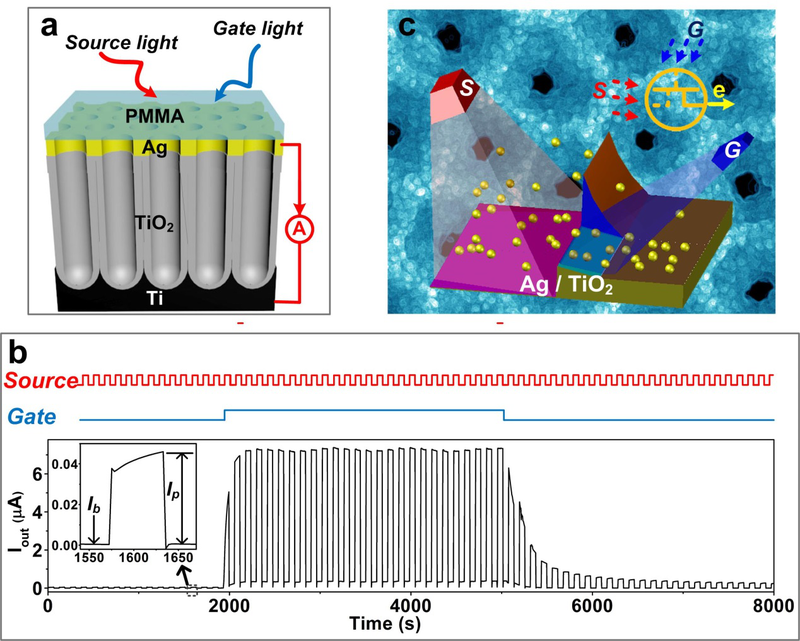 When the hot electrons cross the Ag/TiO2 Schottky barrier, the decreased Schottky barrier can enable more electrons to pass through to generate higher hot-electron photocurrent (Figure c). Thus, the output photocurrent induced by the source light can be controlled enhanced by the gate light, realizing the light controlled photocurrent enhancement. 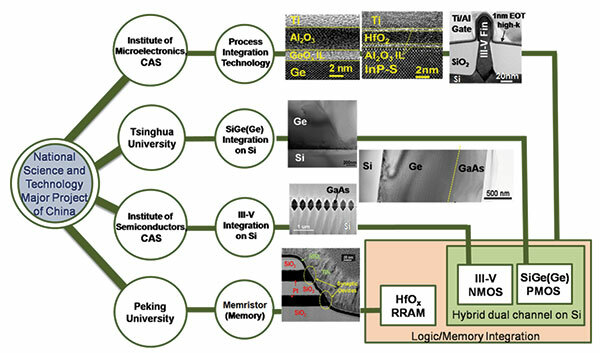 This all-optical-input transistor could realize photoelectric signal conversion and modulation. Moreover, considering that this type of transistor could work without the support of electricity, making it may be used in special environments that prohibit the use of electricity, e.g., flammable gas environments. The research, led by Professor FEI Guangtao at Institute of Solid State Physics, Hefei Institutes of Physical Science, was recently published in journal Advanced Functional Materials.